Today’s tip comes to us via a work colleague… I didn’t know that the Signature feature in Outlook could be used in so many different ways! Check out the two links below for details on how to create, use, and manage signatures. The key to inserting any of your signatures in an email is to place your cursor within the body of the email (wherever you’d like the signature text to go) and select Insert > Signature. One of the cool things about many software functions and features is that they can often be used for purposes other than they were originally intended. 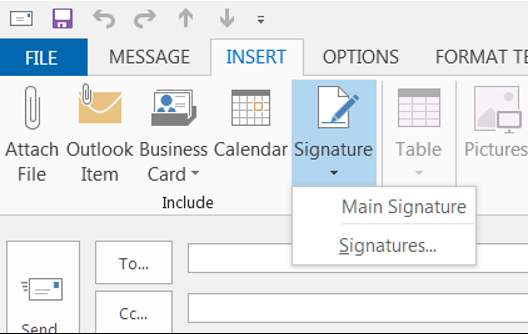 One such function that can provide multiple uses is the Signature feature in Outlook. In addition to defining one or more “email signatures,” you can define other “messages” that can be quickly accessed when writing an email or responding to an email. In recent versions of Outlook, your personalized signatures can include not only text but rich text, images and other types of media. I’m often asked to share certain information and links to information. In those instances I create a signature with that information so the information is readily available when someone asks for it. While I generally ignore inquiries from 3rd parties trying to sell me something, some vendors are very persistent and won’t go away until I tell them I’m not interested. When this happens, I select my “Vendor Thanks but No Thanks” signature. Include an overview of what your team does including roles and key contacts. Add links to your teams SharePoint site. Share information about an upcoming event or conference. If find yourself regularly typing the same information when creating or responding to an email, just key all that info into a signature so it’ readily available when you are crafting your message. To my knowledge, there’s not a practical limit to what can be stored in an Outlook email signature. So you can define one signature – call it “Working Storage” and use it to store all the bits and pieces of info you regularly use. To be sure there are other approaches and tools to effect the same functionality but the nice thing about putting it in a signature is that the info is always just three quick clicks away.